E&JW Glendinning is the largest independent supplier of quarry and concrete products both to the trade and direct to the end user in Devon and Cornwall, UK. Over recent years, they have embarked upon an expansive programme of modernisation and automation, creating a state-of-the-art aggregates processing and supply facilities, which is essential to their business goals and to compete in the modern aggregates market. As part of this, E&JW Glendinning need high-tech sensor solutions. They make high demands on equipment to get the best performance out of their plant. The secondary crusher at the heart of the screening and grading plant in the quarry is typical of this requirement. The feed hopper above it is a critical process control point, this is where the majority of aggregate comes through at some stage. It is a noisy, dusty environment, with unpredictable flow patterns and material behaviours. 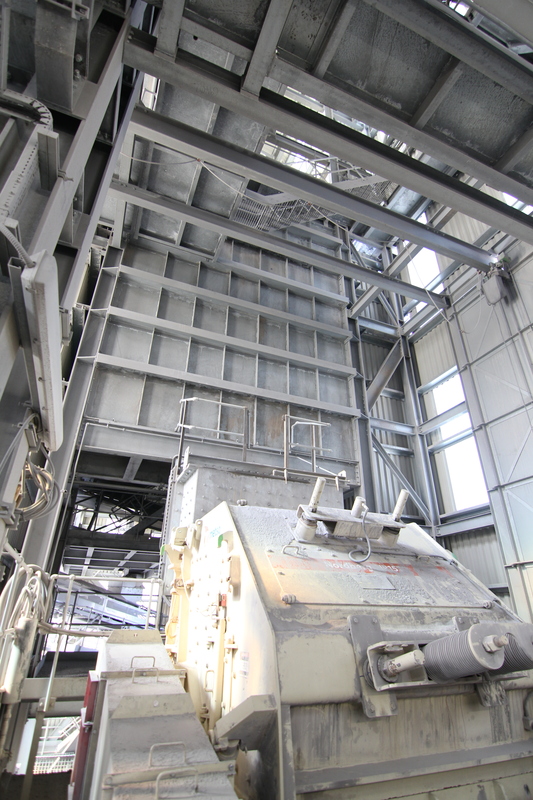 The crusher itself is capable of processing up to 400 tonnes an hour and the whole plant 4,000 tonnes a day. With this level of throughput, its vitally important to get accurate information and control to optimise productivity, energy consumption and product quality from the crusher. Originally, as is the case with most sites in the sector, non-contact ultrasonic level sensors were installed. However, the noise, dust and product build up regularly delivered unreliable performance for the control they required. Instead of an analogue indication of the level in the feed, it was more a series of step changes from low to high and back again, as the reflected echo signals came and went, or they would ‘fail safe high’ through loss of echo. This single measurement problem resulted in regular production halts, poor process and energy management and resets of the sensors to clear the problem. The ultrasonic units required regular maintenance: from cleaning transducers, adjusting angles and tweaking software to try and make them perform as they wanted. The engineers needed to improve the performance of the plant to a level both they and their customers need for this busy quarry. With this in mind, they turned to VEGA to trial one of their new VEGAPULS 69 radar level sensors in this tricky, critical control point. In detail the application consists of a feed hopper over 8m high and around 5m square at the bottom two sides slope down onto a central crusher feed. The hopper can be fed from any one of three different conveyors, which can be simultaneous, and the stone size feeding in can be from dust up to 250mm, as the majority comes from the primary crushing plant. Inside the feed silo it gets a heavy build up of stone on the ‘shoulders’ of the coned section, forming a narrower ‘rat hole’ to the bottom. This material rarely moves, so it was important for the sensor to be able to reliably read down past this point. The VEGAPULS 69 was installed in the existing mounting position of the ultrasonic sensor, very close to the main infeed into the bunker. It was commissioned by the plug-in programmer on the top of the device. As soon as it was installed on the empty silo, with no extra adjustments, the sensor was able to read right down to the bottom of the bin to the outlet conveyor, which boded well. 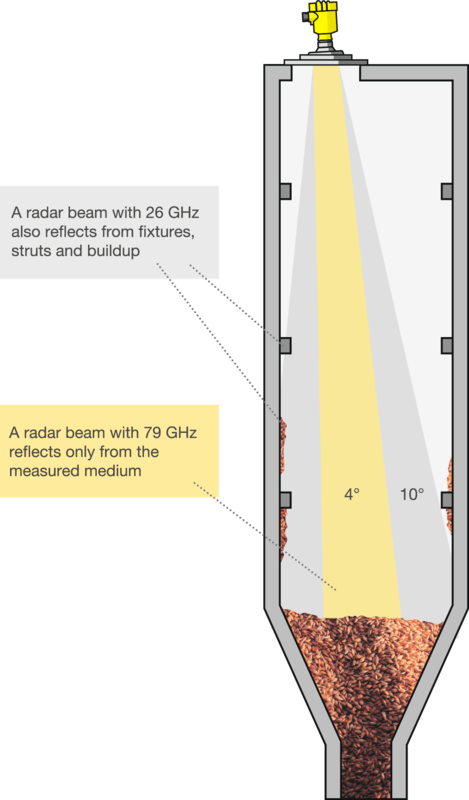 Then, with just a few minor adjustments to optimise the performance of the sensor and its output, the radar has worked successfully without incident for over three months, providing a smooth level output to enable operators to effectively control crusher throughput and the conveyor speeds. This has been done without the need for extra maintenance work and a reduction in downtime caused by measurement problems, a first for this area of the process. VEGAPULS 69 works with very highly focused 79GHz microwaves, not sound waves, to provide a very small beam angle (3.5°), along with optimised sensor performance for solids handling. This, combined with radar’s natural immunity to inflight dust, filling noise and air turbulence, means it promises to be one of the most capable and versatile solids level sensors ever. Already proving itself in a number of difficult applications like this one, where unmeasurable applications are now being successfully solved.